NEWTON – In the season’s first three months, Spearville had used a huge first or second quarter run to build big leads. On Saturday, Spearville again delivered a massive second quarter run en route to a 62-16 win against Hanover in the Eight-Man, Division I sub-state championship game at Newton’s Fischer Field. The game was tied at 16 with 5 minutes, 52 seconds remaining before intermission. Then, Spearville scored 30 unanswered points before the break. The game ended with 2 minutes, 38 seconds left in the third quarter by the 45-point mercy rule. Spearville, led by its big play ability with it run-heavy single-wing offense, had four scores of at least 38 yards in the first half. 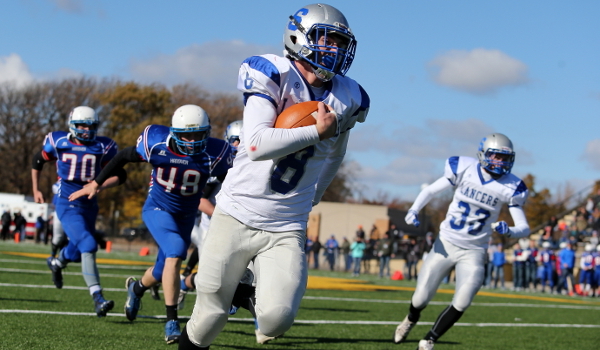 The Lancers finished 13-0 and captured the first football title in school annals. Hanover went 12-1 and collected its second straight runner-up finish. For the third straight contest, Hanover opened with a turnover when the Wildcats lost a fumble. Spearville recovered at its own 32-yard line. On the next play, speedy junior running back Luke Heskamp took a direct snap and broke through for a 48-yard touchdown run. He finished with 12 carries for 104 yards and two scores. Hanover, led by junior quarterback Will Bruna, the single season eight-man record holder for passing yards and passing touchdowns, tied the game on a 13-play, 69-yard drive. Bruna scored on a 2-yard run for an 8-8 tie with 5:15 left in the first quarter. On the next drive, Spearville bumped the lead to 16-8 on a 1-yard run from senior quarterback Nathan Stein. After the Lancers stopped Hanover on fourth down on a Heskamp tackle for loss, Stein committed the Lancers’ only turnover all year when he threw an interception. Hanover tied the score at 16 with 5:57 left in the first half on a 3-yard run by Bruna. Bruna finished 23 of 34 passing for 171 yards but never had a completion longer than 18 yards. On the next drive, Stein, the Lancers’ veteran, shifty signal caller, delivered a 46-yard touchdown run when he broke several tackles for a 24-16 lead. Stein finished with 14 carries for 133 yards and three scores. He went 2 of 4 passing for 50 yards and a touchdown. After a Hanover turnover on downs, Spearville sophomore Bailey Sites broke through on the first play for a 38-yard score. Following a Wildcat punt, Stein scored a 51-yard burst down the sideline when he hurdled two defenders. Fowler yelled at Stein to get out of bounds and stop the clock, but Stein never heard him. Spearville led 40-16 with 53 seconds left in the first half. The Lancers picked off Hanover off a halfback pass and then scored again shortly before halftime. Stein lofted a pass that Hanover nearly picked off. However, it was deflected into the air, and senior Brandon Davis hauled it in for 30 yards. On the next play, Davis scored on a 12-yard pass from Stein for a 46-16 lead at the break. Two early third-quarter scores – a 6-yard run by Stein and seven yards from Heskamp – ended the contest.